MaDonna Jean Barber, (80), of Yellow Bay on Flathead Lake, passed away peacefully surrounded by family and friends on Saturday, February 2 at the Montana Veterans Home Special Care Unit. MaDonna was born in Wolf Point, Montana the 7th child of Harold and Grace Ella Stinger on September 13, 1938. She went to school at Whitefish. She married Dale Oliver Barber on March 8, 1958 in Spokane, Washington. She was very self-sufficient and an early entrepreneur. She graduated from School of Cosmetology and worked as a hairstylist in Whitefish for many years. She enjoyed her time with the Montana Highway Department where she worked both in the office and out in the field. She enjoyed an early retirement and wintered in Parker, Arizona and the summers on Yellow Bay. 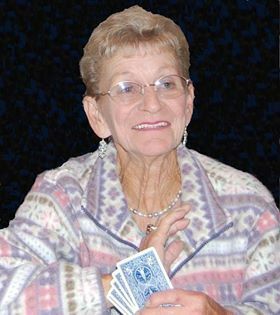 She loved to read, dance, play cribbage, pegs, the washer game and just about any game with a little competition. Her love of knitting and sewing blessed many family members with gifts of love in the form of sweaters, vests, and warm comforting blankets. She adored the outdoors and spent many days and nights camping, fishing and hunting with her beloved husband and family. She taught her boys the value of a great work ethic and how to enjoy life to the fullest. Madonna is preceded in death by her husband Dale, parents Harold and Grace Ella (Brown) Stinger. Brother, Dale. Sisters: Ella Louise (Chet), Doris Emma (Lloyd), Carolyn Esther, Joanne, Cheryl Grace. Niece: Tina and Nephews: Jay, Rick, Lyndon, Roy, and Mitch. Madonna is survived by her Sons: Kevin (Eve)Barber, Neal Barber, Ron (Amanda) Barber. Sisters: Marcia (Jim) Hunnewell and Carla Corbally. Grandchildren: DeNeal (Todd) Fann, Dacy (Jake) Williams, Brie Anne Barber and Dale Oliver Joseph Barber. Great-Grandchildren: Hunter and Hallie Fann. Noxyn, Seeley and Elisha Williams. And her cherished nieces, nephews and friends. The family wishes to extend our sincere thanks to Linda Hubble Schmidt for your love and companionship, the amazing team serving in the Special Care Unit of the Montana Veterans' Home, and the compassionate Frontier Hospice team. Darlington Cremation and Burial is caring for MaDonna and her family.